This post is prompted by a report I saw on a local TV news program. It focused on a trend in modern America where stores are refusing to accept cash as payment for their products or services. The TV report cited Starbucks and Walmart as some of the corporations who are beginning to discriminate against cash purchases on a trial basis. I did a web search and found that such stores as Walmart and Krogers are testing programs in some stores to eliminate human cashiers and go to “cashier-less” transactions (first link). That is not quite the same thing as a cashless store as Walmart in my city have cashier-less check-out aisles where cash is still accepted and change made by machine. Of course, I live in the great “outback” of the USA–the Upper Midwest–where the latest trends reach us only after they are commonplace elsewhere. The trend of true cash-free stores is apparently growing more common on the East Coast, and local governments there are moving to stop the trend toward cashless transactions. The second link and third link detail an effort to implement a state law in New Jersey to forbid stores from moving to a cashless transaction system. The fourth link reports that the city of Philadelphia is doing the same thing, as is New York City (fifth link). Clearly, the move to a cashless society is picking up steam, but the effort to oppose it is also gaining strength. As long-time readers know, I am on the conservative/populist side of the political spectrum, and I believe most of my readers are as well. 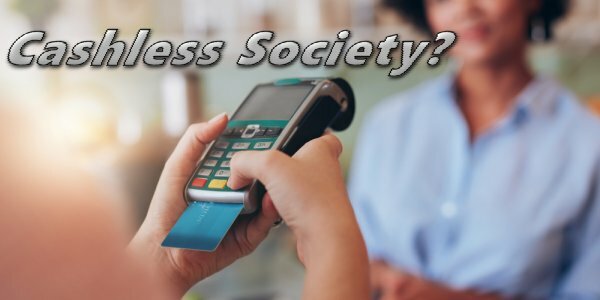 Our first reaction may be that efforts to oppose cashless societies are coming from Christian religious fears that a cashless society is a prelude to a global “mark of the beast” system. In this case, any such first reaction would be wrong. The reason why solidly liberal “blue” states and cities are moving to protect cash-users is that users of cash tend to be members of racial or ethnic minorities, the elderly and poor of any socioeconomic group. The opposition to cashless stores is being driven by concerns that the real reason why stores are going cash-free is that they want to exclude minorities, the elderly and the poor because those stores want to cater only to the richer elites. The sixth link supports such a concern. It reports that approximately one-fourth of all American households do not have bank accounts and they do not use traditional financial services (i.e. credit cards). That is a number much larger than I would have expected. The poor segments of any racial/ethnic group may not be able to afford banking account and credit card fees, so it is logical for the sixth link to state that the burden of having cashless stores would fall proportionately on minority groups. Having cashless stores could also be an intended method to re-segregate American communities via private business practices. I would suggest cashless-only policies would also fall heavily on many elderly people on fixed incomes. Christians are told in many biblical scriptures to remember the poor and help those less fortunate than themselves, so opposing cash-less stores on that grounds alone would be valid for any Christian group. Additionally, Christians have valid reasons to fear that any and all steps to move toward cash-less societies are hastening the arrival of the “beast” system prophesied in the book of Revelation which will have the “control freak” power to monitor and regulate all financial transactions on the planet (Revelation 13:16-18). I agree with that biblically-based Christian concern. Based on both of the above concerns about cashless stores, I urge readers to contact their congressional delegations, state and local officials and even municipal officials to voice opposition to permitting stores to forbid the use of cash. You may also want to mark this date on your calendar as it is a rare time that I am actually supporting a policy which has originated with blue-state liberals. As, a personal aside, I can see why many older citizens prefer to use cash. I’m in my 60s so I relate to these concerns. We, senior citizens, grew up with financial habits and instructions that were totally different than younger generations. We, seniors, find many new digital technologies to be faddish, invasive and unnecessary inventions, and we are not comfortable with using them. Using cash is something we understand and are comfortable with. In my boyhood, I was educated in a two-room schoolhouse in rural South Dakota. Part of our curriculum then was learning how to count and handle money. It was clear in the way the class was taught that using “time payments” was a character flaw unless it was for a major purchase like a VA- or FHA-approved home loan. Financing a car was taught as barely acceptable, but to be avoided if possible by either “saving up” to buy the desired car via cash or lowering your vehicular expectations to buy a vehicle you could afford with cash. There was nothing religious about this curriculum; it was taught to instill in us the dangers of accumulating too much debt and the further danger of being trapped into long-term interest obligations. I’m sure some readers share similar experiences about learning to handle money when they were young. The trend to cashless societies is accelerating worldwide. China is moving very rapidly to a cashless society and is almost there already. Making rapid payments with smart-phones equipped with facial-recognition systems is clearly the wave of the future as is being manifested in China (seventh link). Additional perspectives on China’s rapid move to a cashless society via the use of facial recognition systems replacing signatures on purchases can be found in the eighth link (a menu of topical links submitted for your convenience). Sweden is also rapidly moving to a cashless society, but resistance to a cashless society is growing there as well (ninth link). While I’m no lawyer, I’d like to point out a possible legal obstacle to a cashless society (or to cash-free businesses) in the USA. If you look on a piece of currency in your wallet or purse, you will notice this statement on all US currency bills: “THIS NOTE IS LEGAL TENDER FOR ALL DEBTS PUBLIC AND PRIVATE.” (This statement is printed “in caps” on all US currency so my capitalization of the language was not added for emphasis.) This strongly indicates to me that it is illegal for any business or person within the jurisdictions of the US government to refuse to accept US currency. To satisfy monetary purists, I acknowledge that the Federal Reserve Board (which prints US currency) is not a federal agency but is rather a private bank with a congressional charter to print US currency and control interest rates. That fact notwithstanding, the fact that the US Congress has delegated that power to the Fed puts federal power behind that statement in capital letters on US currency bills. In contrast, there is no language on checks, credit cards, debit cards, etc. that mandate or require the acceptance of payments via their instruments in financial transactions. Only cash has the demand printed on it that it must be accepted for payment in any US currency transaction. Any business that refuses to accept cash payments runs the clear risk of being sued by, any, advocacy group which takes them to court for refusing to accept US currency on US soil. As a point of clarity, it should be noted that US coins are printed by the US Treasury Department, not the Federal Reserve Bank. Due to the legal warning on US currency that it must be accepted as payment for “all” kinds of private and public payments, I think it will be harder to impose a cashless society within the USA than in other nations which do not have such a legal demand on their currency bills that they be accepted in financial transactions. I urge all non-American readers of this blog to check your currency bills and see if you have any similar legal language on them. From a biblical prophetic perspective, it is becoming increasingly likely that what the Apostle John saw in his Revelation 13:16-18 vision of financial transactions being conducted in the latter day “beast” system is/will be a smartphone payments system activated and secured by a person’s own facial recognition points. John, a 1st century AD person, would not have recognized what a computer was and would not have recognized anything being done on a computer as a “financial transaction,” but he would be able to recognize the exchange of goods and services in hand-to-hand transactions via observable actions involving the face and hands. That technology is already here and is spreading rapidly in China even now. China is a Communist Party dictatorship, so it can impose this system very rapidly within their nation. Since Revelation 13:16 mentions John saw “foreheads” involved with latter-day financial transactions, this could indicate either facial recognition systems or retinal scan identifications–either would involve moving one’s forehead toward an object in your hand to conduct a transaction. Since Revelation 13:16 states the “poor” and the “bond” (i.e slaves or servants) will also have to use this technology, it strongly infers that one’s smartphone (or similar digital device) will include everyone’s passport, medical, criminal history, credit rating and all kinds of personal identification on it besides basic banking information. It would have been utterly impossible for Revelation 13:16-18 to have ever been fulfilled in a non-digital, non-high tech world. Now that the world is interconnected in a myriad of digital systems, this prophecy can be fulfilled at any time now. All that is needed is for Babylon, the Great System of Revelation 13, 17 and 18 to fall. Revelation 13 makes it clear the “beast” will impose the Big Brother monitoring/control system seen by John in vision, but the beast system cannot come into being until the cryptic prophesied alliance of the “seven heads and ten horns” overthrows the current global system called Babylon the Great in Revelation 13, 17 and 18. Given that the technologies to implement Revelation 13’s prophecy already exist and given that the current globalist system of Babylon the Great is showing ever-worsening fractures and weaknesses, I wonder how much longer we will have to wait to see the actual fulfillment of Revelation 13, 17 and 18. Technically, it could happen any time now. For more in-depth information on the above topics, please read my free articles, Are We Living in the Biblical Latter Days?, Is Babylon the Great about to Fall…Ushering a New Beast System? and The Babylonian Origin of the Modern Banking System.